Milk and cookies, bread and butter, smoke and salmon, all timeless combinations. 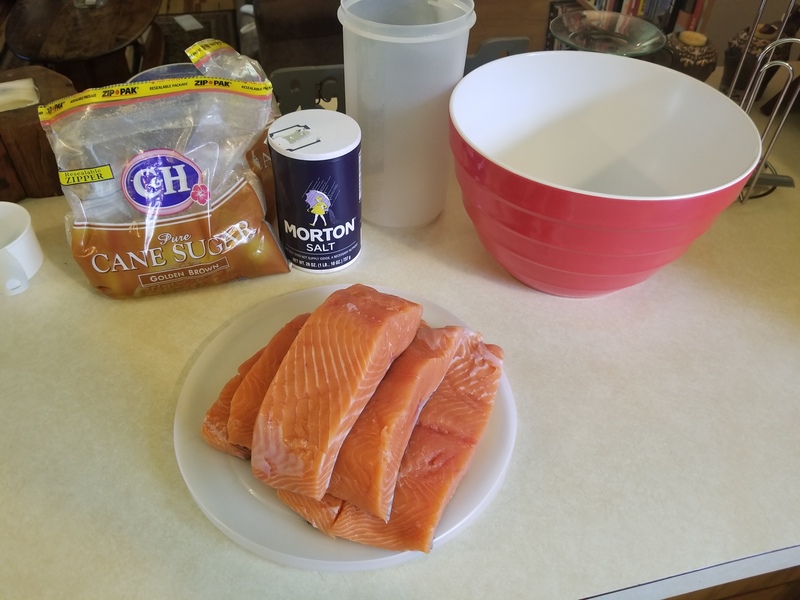 Of course, today, we are looking at smoked salmon, the quint-essential way to prepare a salmon, and perhaps the way most of us came to know it’s amazing flavor. People have been drying and preserving fish for hundreds of years, and it is a art form that is steeped in tradition. For me I can remember my dad smoking his catch in the backyard, and having grown up in the beautiful Pacific Northwest the smell alone conjures images of the native totem animals. The idea of a smoked fish is wonderfully simple; cure it with salt and sugar, and dry it at a low heat over the fire of an aromatic wood. The simplicity of it is key. I don’t want to discourage anyone from experimenting with different ways to cure their catch, but I do want to emphasize how important it is to keep it simple. My recipe is so simple that I could never call it uniquely my own. In fact, it is the same recipe that my father copied from the booklet for his Little Chief smoker many years ago. 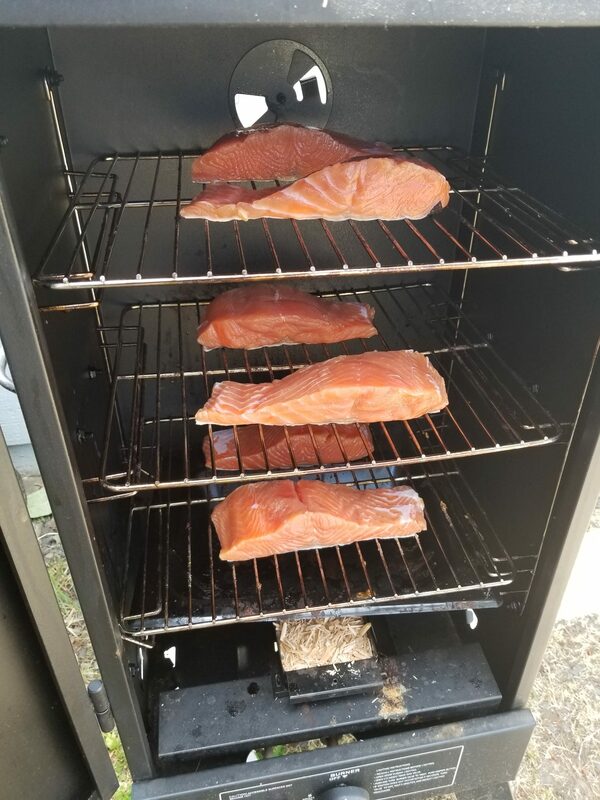 That being said, upon tasting my smoked fish, people usually ask for my recipe, even people with many more years experience in curing and smoking their catch. They rarely believe me when I tell them how simple it really is, but regardless of what they think, I encourage you to test the recipe and method that lay before you… then make it your own. Let’s talk about your equipment. What will you be using to smoke your fish? This recipe calls for a hot smoke, and any smoker that can do that will work well. There are certainly a variety of smokers, from large homemade smokers with a firebox to small electric smokers you load with a pan of wood chips. I have a variety of smokers, but mostly use a pretty basic propane smoker that uses a pan for wood chips. It really does not matter what kind you use, what does matter, is that you know how to use it. Make sure it will run at the correct temperature, and that you know any unique nuances it may have. 2 qts. Ultra pure water. But, let’s break it down a little more. Fresh salmon. You’ll often hear the phrase “That’s one for the smoker.” referring to a fish that probably won’t cut well enough for the dinner table. 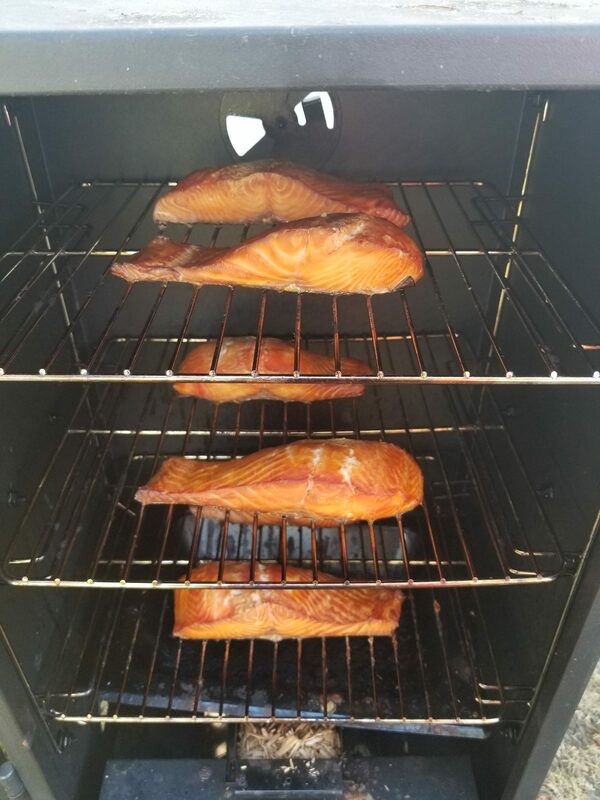 Though it’s true that you could put lower quality cuts in the smoker and pull out a piece of fish that has a delicious smokey flavor, it won’t be the premium product you can expect from using a nice fresh cut of salmon. Pure water. I’ll just say, unless you live where I do, you’ll probably want to use purified water from the store. Tap water isn’t always the greatest quality, and your final product will only be as good as the ingredients you use to make it. Non-iodized salt. It is important that the salt you use does NOT supply an iode, as it can impart an off taste. Don’t ask me what it tastes like, I’ve never made the mistake. Brown sugar. You could use regular sugar, but I think brown sugar has a much better flavor. The brine is easy, and is also a good time to experiment. The two things that make a good brine are salt and sugar, so things like soy sauce, juice, or honey work well in a brine. Just don’t over-complicate it!! For the brine I make you just need to take 1 qt. of warm water and mix it with the salt and sugar very well in the bowl. Once almost all of the salt and sugar is dissolved add 1 qt. of cold water. Now the brine is ready to receive your bounty of fish. Once the Salmon is in the brine, (or any fish you want to smoke) put the whole bowl in the refrigerator for about 24 hours. When you take the fish pieces out of the brine give them a quick rinse in cold water, and lay them out skin side down. Let them sit for about an hour until they get a kind of tacky sheen to them. When they have that look to them they are ready to go into the smoker. I usually arrange the pieces so that the larger ones are closer to the bottom where the heat source is. Load your smoker with wood chips or wood chunks of your choice, I usually put alder wood in mine. You will want to run your smoker around 150-200° F for about 4-5 hours. This will differ if you are using different fish, especially different size fillets. For reference, whole pan-sized trout take around 2 hours at 200°, large trout fillets take about 2.5 hrs, steelhead pieces take about 3-3.5 hours and chinook will take about 4-5 hours. 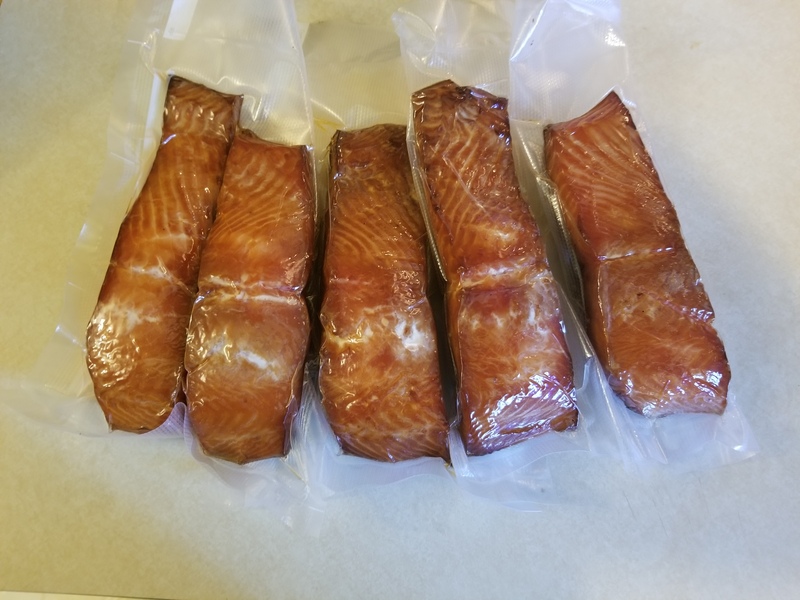 The next step is to vacuum seal the smoked fish, as it will stay fresher for much longer. You don’t HAVE to vacuum seal, but it is highly recommended. The final step is to eat at least one piece fresh out of the smoker, as it will be the best smoked fish you have ever eaten, sweet and salty, still warm, melting in your mouth. I would follow all of these instructions just for one bite of the smoked salmon fresh out of the smoker, that’s how good it is. Once again I’ll say that is it… You now have all the knowledge you need to start smoking your fish. Keep in mind to find your perfect fish, you’ll have to experiment. This recipe works incredibly well with whole trout or fillets of trout, steelhead, and salmon. I hope you will get just as much enjoyment from this recipe as I do. Lastly, I’ll say don’t be stingy. You can win a lot of friends with smoked fish, and you’ll have plenty to go around. Kippered salmon is yummy and can be ideal when served using a mild raspberry vinaigrette mixed green salad topped using fresh or dried cranberries. Also you are able to follow with the kippered salmon steaks with garlic mashed potatoes, couscous, or wild rice. Vegetables to go with the dish may consist of seared asparagus, steamed broccoli, or blanched greens.I create this recipe at every saturday and sunday. . ! 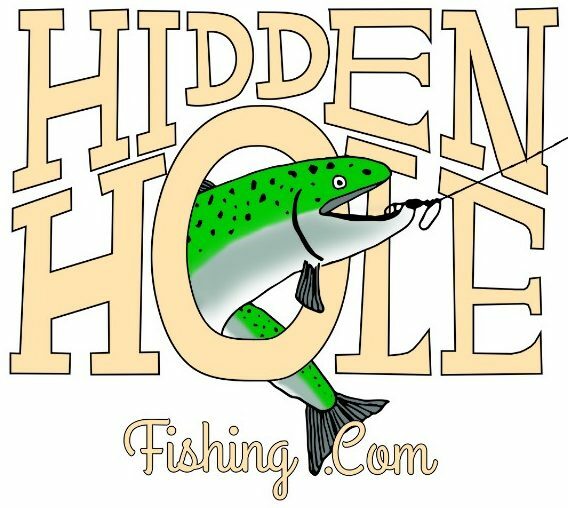 Copyright © 2018 Hidden Hole Fishing. All rights reserved.